I can’t believe Lucas is going to be 4 in 2 weeks! We asked him what he wants to do for his birthday and he wants a family get together at my Mums, he wants to go to a cafe for a drink and piece of cake with one of his friends and he wants to go to the cinema to watch the Lego Movie 2 with D and I. This year it seems we will be fairly low key this year which I’m quite glad about before he starts school in September and might want a bigger party next year. The great thing about planning a pre school party is that you can still get away with only inviting one or two friends so it doesn’t need to be a huge event, overly expensive or stressful. Last year we went for a birthday afternoon tea which we really enjoyed. You could do your own at home or go to a cafe. We went to a cafe and they asked what theme we wanted and decorated accordingly. I asked for trains. They made train decorated cupcakes and decorated the table with train accessories. There are plenty of inflatable playgrounds and trampoline parks now, most of which have offers on for pre schoolers Monday-Friday so it can be a lot cheaper than doing it on a weekend or after school hours. It also means that you won’t have older children accidentally knocking into the smaller ones. Lucas has been to the cinema once and loved it, he is so excited to be going for his birthday and it’s amazing timing that the Lego movie is released the week before his birthday. Some of the cinemas offer cheaper prices for children on certain days so it’s worth checking in advance and also, take your snacks and bottles of drinks in a backpack so you don’t have to spend a fortune on the cinema prices! Invite one of their friends or even do it on your own with your child. Get yourself some new pjs and make it a real treat night together. The Pyjama Factory sent* Lucas and I some pjs and we love them. The have an array of top quality pyjamas with rock bottom prices in line with all the latest fashion trends and popular characters. 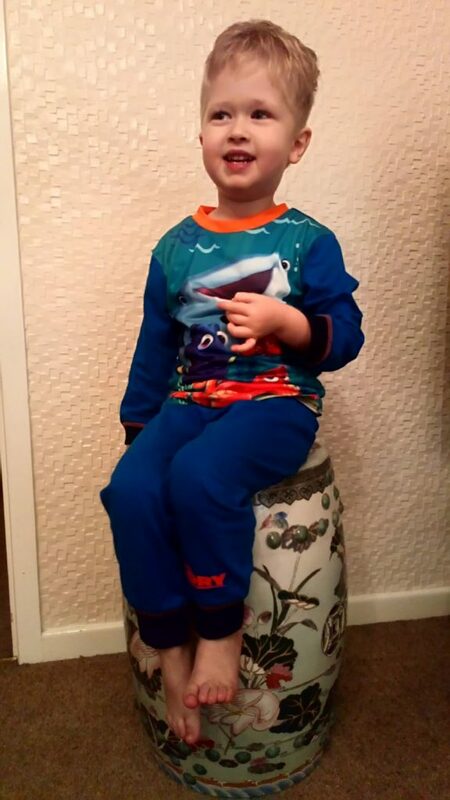 Lucas chose a Finding Dory set, the top features an adorable Finding Dory and friends print and the bottoms have a fully elasticated waist and cuffed ankles for extra comfort. Lucas is really pleased with them and I am really happy with the quality of them, they have washed really well too as I was a bit wary with the colours being so bright but they have kept their colour well. 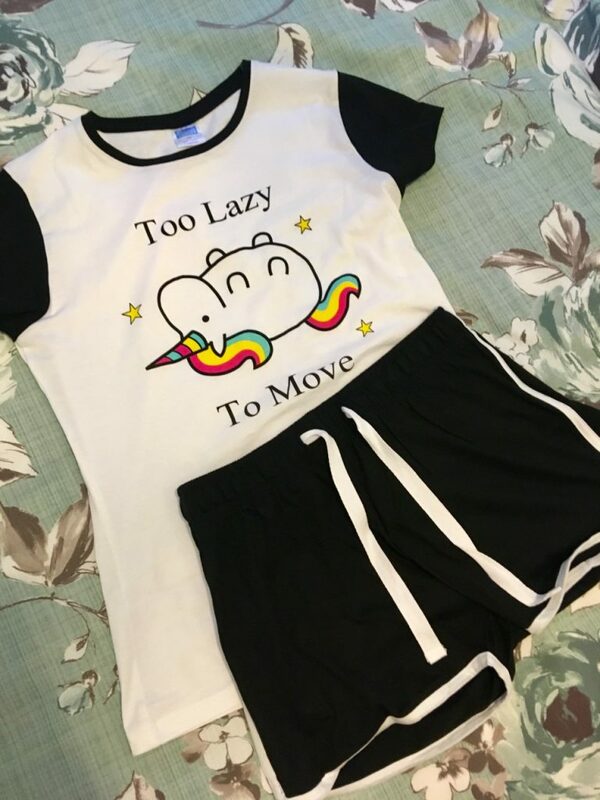 I chose a Unicorn pyjama set with a “Too Lazy To Move” slogan printed across the front . This set is complete with matching elasticated shorts. They are very comfortable and the sizing is true to size. For the pyjama party, you could make pizzas from scratch, with a bought pizza base or adding topping into a bought cheese and tomato pizza. Play board games and watch a film in bed or snuggled up on the sofa with snacks together. Thank you for the giveaway, good luck to everyone! Wonderful thanks! The site has lots of pjs and onesies to choose from! Pyjama Parties are brilliant. Son loved the cinema trip parties as well. The last one we did was for the Lego movie ended up in a cake shop for the biggest hot chocolate ever. Fab prize, good luck everyone! I love the “Too Lazy To Move” unicorn pyjamas. Lovely collection of pyjamas. Thank you for the chance. Lovely selection of PJs – I love Pj’s – once on then it is relax time. Some lovely pj’s on here, fingers crossed. I have so many pairs of pyjamas, they’re my favourite thing in the world to be wearing! Lovely prize. I’ve never won anything from gleam so hopefully I get lucky! Some great PJs there, I love the Eeyore Women’s Is It The weekend Yet? Pyjamas. My son loves pyjamas, as do i! They have some lovely colourful designs at the PJ Factory. Lovely prize. Good luck everyone! Lovely PJs, thanks for the giveaway! We’d love some Hey Duggee PJ’s! Pyjamas parties are fun for kids, especially when they are a bit older and can have sleepovers. For some reason kids love the excitement of all sleeping on the floor together. Thanks for the chance. Would love a pair of pjs for my son. Just spotted the Floss pyjamas on the website – made me giggle as my son is *always* doing this weird dance!! Fab comp! Really fantastic choice of pyjamas. Some lovely simple party ideas here, thank you. There are so great designs here. I would live in pyjamas constantly if I had the chance. So many cute pjs on the website! Would love to win a pair! these look amazing! Would love to win them!! I love the variety of styles and designs across the site and the prices are reasonable too. 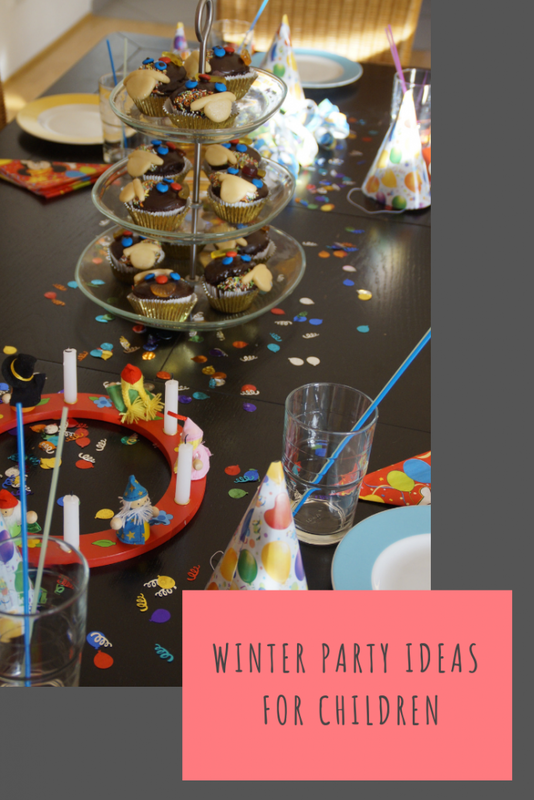 Those are some fab party ideas, I’ve got a Winter baby too! I’d love to win some PJ’s for her! Pyjama parties are fab 🙂 I love the look of these pyjamas. Great range! Lovely selection of Pyjama’s, My favourite are the Too lazy to move unicorn Pyjama set. There are some great designs! What a super prize – I love the design and the colours. Loving the unicorn ones – my niece would love them too! Wow, awesome giveaway. Thank you so much for the chance. Omg I never knew this place existed, I love pj partys and given me a great idea with the kids. Great pyjamas for my grandchildren! Gorgeous PJs and gorgeous pics. Thanks for the giveaway. Great giveaway, count me in! Lots of lovely PJs – hard to choose! fantastic! wow what a choice! Fantastic giveaway! Thank you! I think that the Girls Official Grumpy Cat Long Pyjamas are so cute! My son would also love the Finding Dory PJs! New PJ’s are always a treat. 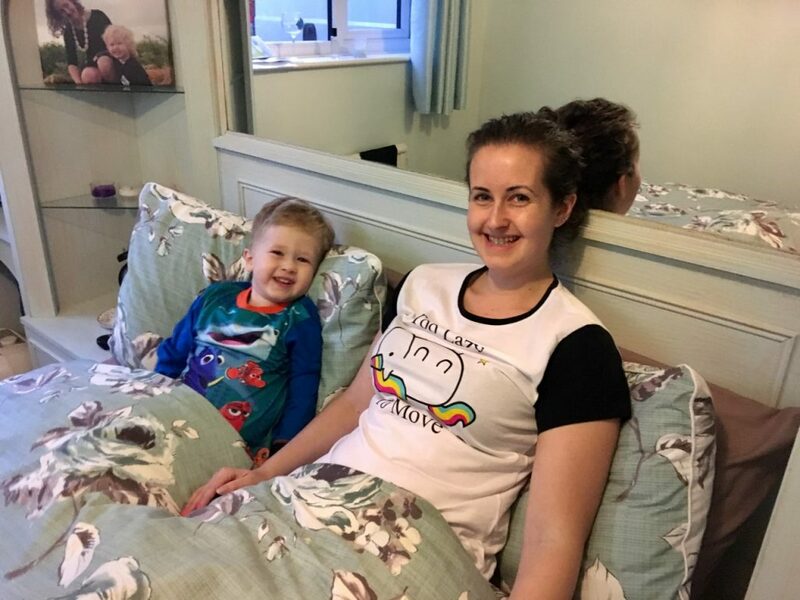 We love pj’s at our house, the site has some lovely one’s. I love the choice on the website and already have my eye on a few! Some great designs on the site! I’m definitely stealing some of these ideas. My eldest boys are 9 and 4 on the 18th july and off school so may do party in the day to hopefully save money! My son would love their fortnight pj’s. I love pyjamas I get into mine as soon as I can! What a fsb selection of pj’s . Thanks for the chance to be your lucky winner. You can never have too many pairs of pjs, thanks for the chance. How lovely! Nothing nicer than new cosy Jim jams.